easygenerator | How to sell Chipolo Plus in 10 minutes? How to sell Chipolo Plus in 10 minutes? We'd like to introduce you to our new sales learning program. We've prepared it with a single purpose: to help you sell better, more and faster! During this short course, you will learn exactly how to efficiently present and sell Chipolo Plus. The introduction to Chipolo Plus and its basic functions. A Simple Explanation of Chipolo Plus' advanced tracking functions. The main sales arguments on WHY Chipolo Plus is the perfect business gift. An overview of Chipolo Plus' technical features. You will learn about everything you need to know in order to better sell Chipolo Plus through our short videos. You will also have access to additional explanatory texts. At the end of every course part you will be asked to reinforce your newly gained knowledge through a simple questionnaire. We hope you'll enjoy this course as much as we have enjoyed preparing it! We'll always do our best to help you sell better! Chipolo Plus is the world’s loudest and most advanced water resistant Bluetooth tracker. It helps you easily and quickly ﬁnd your lost items with the help of your phone. You may put it on your keys, wallet, luggage or wear it on your purse with style. Whenever you can’t find the item you're looking for, you’ll be able to find it using a simple mobile app that will make Chipolo Plus ring. On the other hand, if you are looking for your phone, just double click the Chipolo Plus and your phone will start ringing even if it’s on silent mode. Ring your keys, phone, anything. Ring lost items just like you’d call a lost phone. If your Chipolo Plus is within the 200-foot Bluetooth range, it will play a loud sound until you find it. And if you still can’t find your lost item, the Chipolo community will help you in your search. 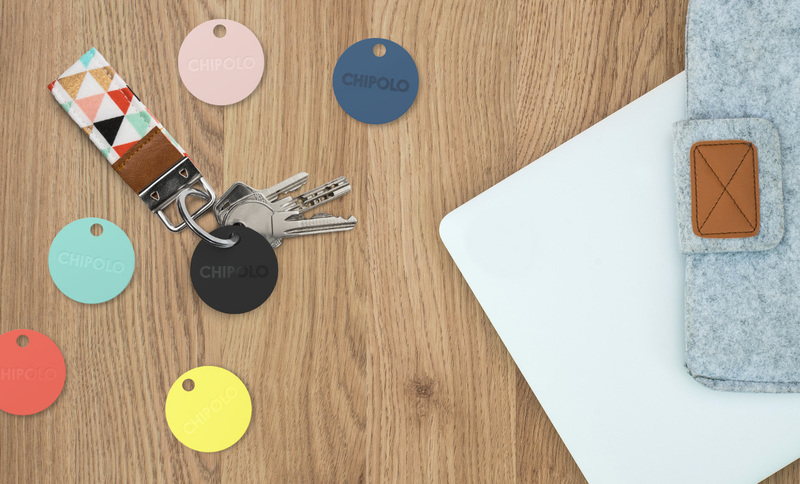 Chipolo Plus is the world's loudest and most advanced Bluetooth item finder. To find your item: ring the attached Chipolo, just like you'd ring a phone, using your Chipolo app. To find your phone: double-click the Chipolo Plus to ring your phone. When outside the Bluetooth range: access the Chipolo community to help you in your search. You may put it on ANYTHING you don't want to lose (keys, wallets, luggage ...). Chipolo Plus starts playing a loud sound. Your Chipolo Plus starts vibrating. Your smart phone starts ringing. You shake your Chipolo Plus and the phone rings even if it’s on silent. You call your phone via a stationery line and the phone rings even if it’s on silent. You double-press your Chipolo Plus and the phone rings even if it’s on silent. Find it near. Your Android or iOS smart phone app may be connected to up to nine Chipolo Pluses via a strong 200-foot (60 meters) range Bluetooth connection. If you need to find your lost item, just open your Chipolo app and choose the Chipolo Plus you’re looking for. It will play a loud 100dB sound until you find it. If you forget your item and get out of its range, your phone will notify you, so you may return to the place you left your item at. Find it far. If you are looking for an item that is more than 200 feet away, a map in your Chipolo app will show you where exactly your phone and the item you're looking for were connected last. Activate the Chipolo community. And if you still can’t find your Chipolo Plus, you may anonymously report it as missing. This will activate all the Chipolo app users’ phones in more than 150 countries and send them on a search mission. The moment another Chipolo community member gets in range of your Chipolo Plus, you will be notified. This feature is 100% private, so no one knows you're looking for a lost item but you. Find your phone. And what if you have your Chipolo Plus but can’t find your smart phone? Just double press the Chipolo Plus and your phone will start ringing. Even if it’s on silent. If you lost your phone far away, log into our website app to see its last known location, to make it ring, or to send a lock-screen message to the friendly folks who might find it. When you get out of the 200-foot (60 meters) Bluetooth range, you'll receive a notification, so you may return to the place you left your item at. The Chipolo community is 100% private, so no one knows you're looking for a lost item but you. The Chipolo Plus app is compatible with both Android and iOS smart phones. You won’t be able to find your Chipolo Plus. Your Chipolo Plus will ring anyway. Your Chipolo Plus will start vibrating. Your Chipolo app will show you a map with the last known location your smart phone and the Chipolo Plus were connected at. Nothing. You can use the app when you realise you lost it. Chipolo Plus starts to ring. Your smart phone notifies you you’ve left your Chipolo Plus behind. You double-press your Chipolo Plus and the phone starts ringing even if it’s kilometres away. You need to buy a new phone. You log into the Chipolo Community on your computer and see a map of where the devices were connected last. You can send a notification to your phone via the online Community app and let the finder know where to contact you. It’s estimated that people spend 10 minutes a day in search for their misplaced items. And every busy person is always looking for ways to spend their time more efficiently. A Chipolo Plus with your logo on it will become their best friend immediately. It’s simple – Chipolo Plus will immediately add at least 10 extra free minutes to their busy routine. Chipolo Plus comes in seven different colours (Ocean Blue, Mint Green, Lemon Yellow, Rose Quartz, Coral Red, Pearl White and Charcoal Black) but may also be produced in a colour of your choosing. It’s packed in a neatly designed box that is also fully customisable. And not just that, your logo may also be implemented in the Chipolo Application. With more than a million Chipolos sold worldwide and more than 300,000 daily users, it’s clear why Chipolo was selected for the Promotional Gift Award winner in 2014. People spend at least 10 minutes a day looking for their misplaced valuables. In that sense Chipolo not only guarantees peace of mind but actually saves precious time and energy. Chipolo Plus is available in 7 different colours, but may also be produced in a custom colour of choice. The fully customisable packaging, along with the option of personalising the Chipolo app with a logo of choice, enables you to always give a unique touch to your branding desires. Because it helps its users save time. Because it needs no maintenance. The user can replace it. The user should throw their Chipolo Plus away and forget about it. The user can buy one of the latest Chipolo products for 50 percent off. Chipolo Plus uses Bluetooth Low Energy (BLE) technology that can range up to 200 ft (60 meters), when there is a clear line of sight from the device to the Chipolo Plus. If your Chipolo Plus is out of Bluetooth range, you can use the 'Last Known Location' feature to see where it was last seen on the map, or you can mark your Chipolo Plus as lost and it will allow your Chipolo Plus to be discovered by the community. The Chipolo community is global and spans more than 150 countries. Chipolo Plus is maintenance-free. It can run a full year with zero upkeep. No battery replacement, no charging. After 1 year, the user can replace the old Chipolo Plus for a fraction of the cost (50% off the MSRP price). Before your Chipolo Pluses will run out of battery power, the users will be able to obtain new ones. These may also be printed with your logo. You can also choose a custom ring tone with Click & Find feature. Chipolo Plus is water resistant up to IP5 standards making it perfect for bikes, GoPro, luggage and more. Chipolo Plus uses Bluetooth Low Energy (BLE) technology that can range up to 200ft (60m). If you move out of Bluetooth range, just use the 'Last Know Location' feature or the Chipolo Community. Chipolo Plus is maintenance-free. It can run up to a full year with zero upkeep. After 1 year, the user may replace the old Chipolo Plus for 50% off the MSRP price and choose the latest device Chipolo has to offer at the time. The user may also choose to order a branded replacement. Not at all. It only vibrates. It’s pretty quiet so it doesn’t disturb anyone. It has a 50 dB sound. It has a 100 dB sound. It needs to be cleaned daily. It needs to be put apart and cleaned internally once per month. It needs absolutely no maintenance. Now you're ready to sell Chipolo Plus like a pro! Feel free to access our exclusive sales materials to help you sell better.